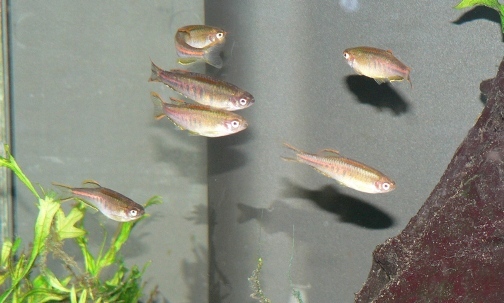 Danios are minnow-like schooling fish that work very well in community aquariums. These tough little friends are commonly used to cycle new aquariums because of their ability to tolerate a wide variety of water conditions. This type of fish comes from Southern Asia and is most commonly found in streams and rice paddies. They make wonderful friends in groups and add constant movement to your aquarium. These little open water swimmers love a bit of flowing current and will sometimes shoal in the outflow of your fitration system. Keep them in groups to avoid fin nipping and to add some movement to your aquarium. These fish are fairly easy to keep and breed. Feeding these little guys is a breeze. They will enthusiastically eat many different types of food. Over feeding will be your main concern because they will almost eat themselves to death. They make excellent fish for new aquarists and have a couple of handy utility functions. Small schooling fish are often used as dither fish, or fish that entice other less active fish to leave their hiding spots. The flashing, quick swimming action of these fish encourage their aquarium neighbors to come out and play. Cycling a new aquarium can be a hassle, especially if you use fish to do it. These little guys can be a cheap and effective way to kickstart your Nitrogen Cycle. If you have not already done so, check out the Cycling With Fish page. Providing beauty in numbers, a small school of Danios will make your community aquarium a hopping place to be for peaceful fish. Below are some common types of Danios. Take a look at their profiles and make some new friends. Quick, skittish fish that can outrun your big Cichlids. In dim light this little guy rocks bright colors. These are quick little fish that jump out of the water. You will need a hood on your aquarium. This is an intersesting, very common fish that loves to shoal in a group. For more information, go to Wikipedia's Danios page. Do You Have A Favorite Danio? We all have a favorite fish. Somewhere in your aquarium you have a fish that you are proud of. If you have a favorite friend that is a Danio, take a picture and share a story about it with us.